A student wins, a nail artist emerges: When we met Ashley Gregory at America’s Beauty Show (ABS) in Chicago, she was a nail student who had just won the International Nail Technician of the Year division in the Stars Photo Competition. We were so impressed we asked her if we could use her winning image on the cover of this month’s issue. 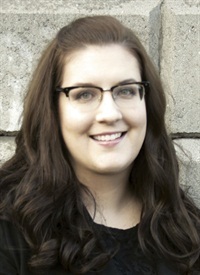 Gregory passed the Illinois state board exam in April. She’s excited about learning the ins and outs of salon life and all aspects of the nail industry. She’s also putting together a portfolio and seeking representation so she can work in fashion, print, and film. Back in December 2012, she created POP Nails as a brand name for her nail concept while she was in school. You can see her work at www.facebook.com/popnailschicago. For her entry in the Stars Photo Competition, Gregory was inspired by fashion. “This look was about making the model’s nails the ultimate fashion accessory. To me, crocodile skin is synonymous with luxury handbags so I wanted to recreate that classic style and rich texture,” she says. 1. Prep the nail and apply tip of your choice. Trim the tip to the desired length. Blend the tip and file the free edge into an oval shape. Gently remove the shine on the nail tip with a 100-grit buffer-style file. Wipe the nail surface with 99% alcohol to remove filings and oil. Begin acrylic application by applying a thin layer of OPI Bond-Ex primer to the exposed natural nail surface. 2. Apply a thin layer of charcoal gray acrylic to the entire nail surface. Gregory used OPI Absolute Acrylic powder in Perfect White with CND Additive Black Pigment in a ratio of 2:1. 3. Cover the nail tip with gray acrylic and smooth it from the cuticle to the free edge with a wet brush dipped in monomer. 4. 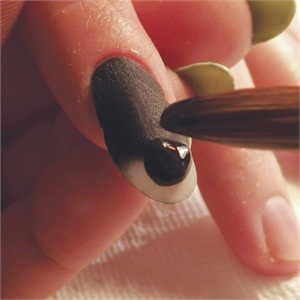 Quickly apply a large ball of wet black acrylic to the stress area, smoothing it out across the entire nail plate. Gregory used OPI Absolute powder in Crystal Clear with CND Additive Black Pigment in a ratio of 2:1. Work quickly to ensure the entire nail is wet at the same time. 5. Sprinkle a small sheet of plastic mesh with a thin layer of clear acrylic powder to avoid sticking. 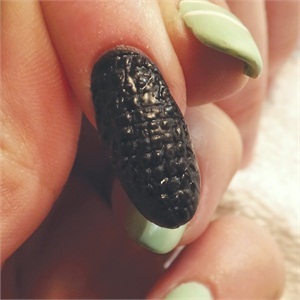 Before the black acrylic layer cures, press the mesh into the surface of the nail, pulling and stretching the mesh as desired to create a scaly effect. Lift the mesh straight off the nail before the acrylic cures. 6. Using the belly of a dry acrylic brush, press down any overly raised areas, watching for potential spots where snags could occur. 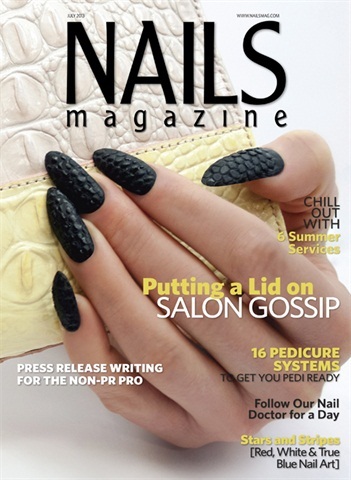 Press lightly over the entire nail surface to create scales. 7. Allow the nail to cure completely to a matte finish. Using a small detail nail art brush, paint each separate scale with black gel-polish. Gregory used Cuccio Color Veneer in 2AM in Hollywood. 8. Cure the nails in an LED lamp for 30 seconds. Carefully remove the dispersion layer with 99% alcohol and a lint-free wipe.